Christine Maguire’s tattoo was done by Dave at Federal Hill Tattoo in Providence, RI. Now, this was an unusual shoot. You know how they say, “You start out going to the 7-11 and you end up at Bonnaroo”? This shoot was something like that. The focal image of Christine’s tattoo is a Buddha. Since Christine is an amazing yoga instructor and she’s made a lifestyle choice about this, it’s a really important focal point. I thought of a lot of ways to photograph her Buddha ahead of time. Had big artistic plans for him. So much for that. It’s hard to explain what it was, because it had nothing whatsoever with the line work, saturation or compositional thing about the tattoo itself. It’s all on me, understood. But the thing is that confronting that Buddha with the lens, nothing was going right. I worked for it, going back two more times, because if something’s not working, I move on to something else for a while and regroup. The composition surrounding the Buddha in this tattoo had more than enough to get things back on track, so I just went back and tried again and again. In the last try, I could have sworn that I got a couple of shots. I mean, I would have kept going if I realized they weren’t good. This Buddha did not want to be photographed. When I told this to Christine, she was not at all surprised. She said, “We’re going to have to have a glass of wine, and I’ll tell you the story about the Buddha. Maybe he’ll let you photograph him then.” I’ll update this if and when I finally can photograph him. As weird as things were going with the Buddha, things got even stranger in another area of the tattoo. As you’ll see below, Christine’s eagle decided to fly for us. 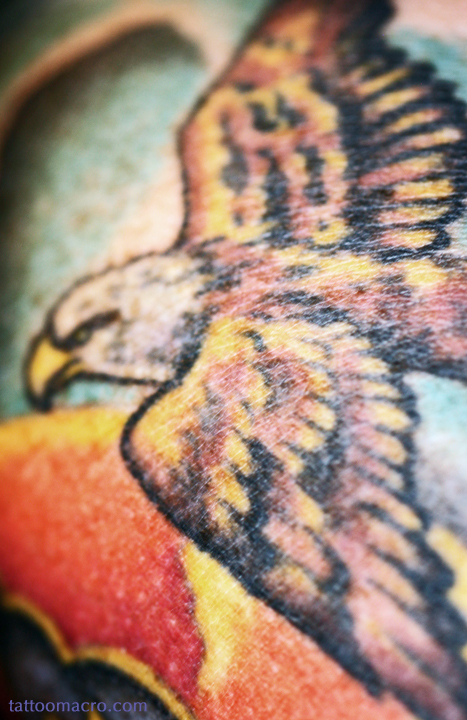 Baer in mind that this eagle is not the focal point of the whole tattoo composition (the Buddha is). This eagle is in the background!